As I have mentioned many times in the last month of posts, red meat on Pinch of Yum is sort of a new and/or rare thing. See what I did there? I’ve never been much of a meat eater and I’d just rather make meals with plants (read: noodles) because there is less careful preparation, a lot of awesome taste, and ample opportunity for boatloads of sauce. It’s no secret that I don’t love chicken – although if it’s coated in white wine and shallots and butter and bacon, I’m more than happy to talk about it – and I’m just not super excited about any sort of red meat situation. But gosh, you guys. Lately I am a hungry girl who is really enjoying a meaty-full recipe. I’m thinking it might have to do with being sugar free right now – I think I’m making up for the lacking sugar with a little bit of extra protein. Right? Remember the steak and cheddar mac and cheese? And must I remind of you of the spicy sausage rigatoni? And now this. This is my twilight food zone. Let’s not pretend I’m something I’m not here. I can face the truth. Being a steak newb, I am not quite ready to cook a perfect steak in ONE WHOLE PIECE. Major intimidation. Let’s just leave that to someone who knows what they’re doing and/or is not still stuck in the anti-foodie habit of ordering her steak cooked medium well. So naturally, cutting up said steak into small bite-sized baby pieces and giving them a super quick sear in browned butter seemed so much more my style. So that’s exactly what I did and IT ROCKED MY LIFE. Especially when we followed up the quick sear with a quick swim in that luscious DeLallo creamy vodka sauce which, if I may, might be the best tomato sauce I’ve ever had from a jar, evereverever. I honestly will probably never make my own sauce again. No point whatsoever. This saucy vodka steak, which took no more than a few minutes, was then scooped up and served piping hot onto a pile of raw, crispy-spiraly zucchini noodles, because one thing I take issue with when it comes to zucchini noodles is their watery sogginess, so I just skipped the cooking part and left them raw, which was a) faster, and b) tastier. Highly recommend. Of course, if you like pasta, please. By all means. You know how I feel about all things noodle. 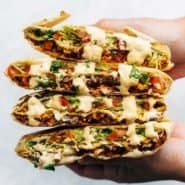 But I will just give a soft encouragement to at least try this combo with zucchini noodles, whether you use the magic machine known as a SPIRALIZER or just peel them really thinly with a Y-Peeler . I am really enjoying my spiralizer deez dayz and I truly think these light, crispy zucchini noodles are just the right balance to the heaviness of the steak and the vodka sauce. We are still in the midst of our Safe Families placement with the three kids, and as I posted in my VIP Facebook group last week (and as you might have seen on SnapChat), I feel like with the sudden addition of the littles to our 900 square foot house, I’ve lost a little bit of my cooking mojo. A little bit, or maybe a lot bit. For me, fights over the Hungry Caterpillar book = anxiety = lack of appetite, plus the tiredness factor is REALLY REAL. Finding things to cook for the last 9 days has been really difficult. I don’t just mean blog cook – I mean life cook. Like, okay, it’s dinner time and now we have a responsibility to help these kiddos actually eat for real, and NO, chips and salsa do not cut it. Bjork is helping out majorly with kids’ choice specialties like spaghetti and hot dogs, which is a huge deal because previously his only recipe of choice was scrambled eggs and coffee. I love you, Bjork! But this recipe? This deliciously filling, veggie-friendly, 4 ingredient recipe that’s ready in 20 minutes or less? Oh Praise Be. I seriously cannot think of an easier meal, other than Friday’s chicken nuggets that took a direct path from freezer to oven to kids’ mouths to… ahem… obviously NOT our mouths because we would never be that desperately exhausted. *scream* Someone please put me in a time out. This recipe is for the tired, hungry, need-a-filling-recipe-STAT peeps of the world! Cuz ur my kindred spirits right now. Only 4 ingredients and 20 minutes to make this Creamy Vodka Steak Pasta on zucchini noodles! So very simple and so delicious! I really don’t know how you do all you do Lindsay! I have similar steak-y sentiments! (Plants and noodles FOR LIFE). I grilled my first whole steak a few weeks ago and almost passed out, I was so nervous. 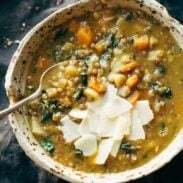 This recipe looks much friendlier and more flavorful too! Sounds like we are on the same wavelength! Thanks for the comment, Erin! I LOVE me a good piece of steak, but still require the hubs to cook it in its natural, hunk of meat form. I can TOTALLY handle cooking this steak recipe though, and I KNOW that my taste buds can MAJORLY handle shoveling it into my face! Pinned! That sauce! Ugh. so good. I must confess that I am definitely one of those ladies who like 4 ingredient recipes! And this zucchini steak combination looks amazing! ME TOOOOO! easy for the win. This looks incredible! I’m always looking for an fun way to make zucchini noodles more interesting. I love the short ingredient list, too! I can’t wait to give this recipe a whirl. It’s beautiful! Thank you Sydney! Appreciate that! Makes sense, when you give up one thing I feel like you have to replace it with another. I’m not a HUGE red meat eater, only because for some reason I associate it with special occasions, I actually love it in all forms, and this “pasta” totally in love. Thanks Nicole! 🙂 my dad makes steak for our birthdays so I associate it with special occasions, too. Except this time – easy weeknight dinner! Best easy recipe ever, WOW!! Dooooo it! 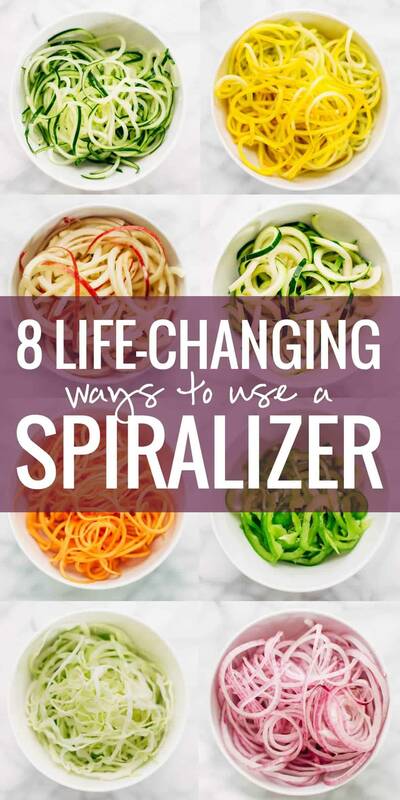 love that you are loving the spiralizer, too! Oh yum! My husband is a steak lover and will LOVE this dish! So awesome! Thanks Emily! Hope you guys love it as much as we did! Chicken nuggets and grilled cheese. Total life savers! Ooh, happy early birthday! Fingers crossed for the spiralizer! Great recipe! thank you a lot Lindsay! Ooooh, loving the brown butter and steak idea. I can’t tell you how many times I’ve spent all day in the kitchen perfecting a recipe only to have dinner roll around and I’m too exhausted and fooded out to do anything other than nuggets, mac n cheese, and fruit. Done and done! Btw Love the photos. Beautiful! Thank you Samantha! Means a lot! I have yet to make a steak “pasta” dish and the limited ingredients in this one are right up my alley! Yay for more “zoodle” recipes too! This recipe is right up my alley – fast and easy. Plus, I LOVE zucchini noodles. I could honestly eat them every day they are that delicious. I put mine in a covered microwave safe dish and cook them only for 2 or 3 minutes on high, then season them with salt and pepper – they still have lots of crunch. And my spiralizer is my new favourite kitchen toy, I am late to the game but now completely understand why people want to spiralize everything! I love the zoodles recipes; thank you!! Thank you so much Hannah! We’ve been so incredibly blessed (and I don’t use that word lightly) by people in our lives who have been our “extra hands” during these last two weeks – it’s been such an overwhelming relief to get a dinner delivered, an extra person around at bedtime, etc. Thank you for your sweet comment! Super encouraging. Thank you Lindsay the recipe is excellent and appetizing. You may be a newby on steak, Lindsay, but those photo tell another story!!!! It look amazing and delicious!! And when I read the ingreadients my mouth start to produce to much water! I will definitly try it! Thanks Cat! 🙂 Hope you like it! This is my husband’s favorite meal, Pasta! Now that his birthday is coming, i will surprise him with this tasty recipe. Thank you Lindsay for sharing. Thanks Chella! I hope you guys like it! Wow!! That pasta dish looks so hearty and delicious. I love the zuchinni pasta! Welcome to steak-dom! I have been low carbing it for years. . .so steak is a regular on our menu. And that snazzy sauce you crowned yours with. . . I bet it takes the steak to a whole new level. This recipe looks delicious! I love the short ingredient list, too! I really like your moves with cutting it up into tiny pieces and searing it in brown butter I’m too exhausted and fooded out to do anything other than nuggets and fruit. You’re doing awesome. Thank you Lindsay for sharing.